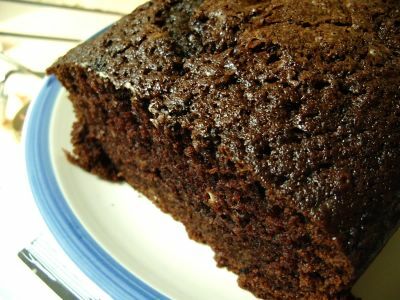 Dense Chocolate Loaf Cake – o frabjous day! 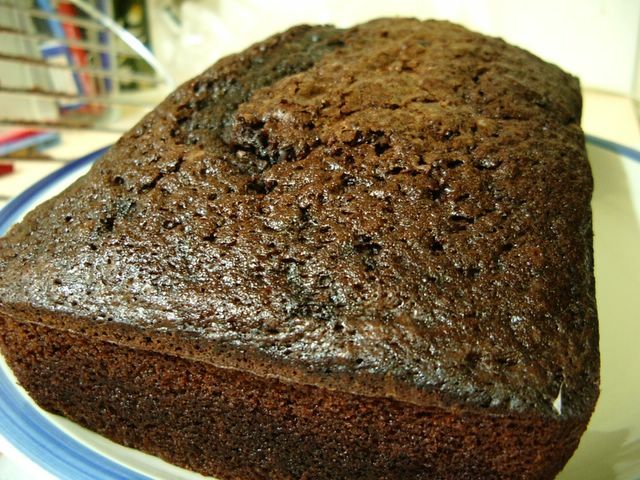 This is a Nigella Lawson recipe from How To Be a Domestic Goddess, and I’ve been a little hesitant about trying it, because it looks so moist and sticky, and as Nigella and I have vastly different ovens, I worried about being able to tell if it was cooked. However, a craving for chocolate cake forced me to give it a try, and experimenting with oven temperatures turned out quite well. I think it was a little overcooked, as you can see from the paler brown near the crust, and I was lazy in adding the flour, which resulted in lumps. However, the result was still beautiful – a plain, loaf cake, as Nigella describes it, but beautifully moist, and considering the amount of sugar in it, not too sweet. It’s just beautifully rich and chocolatey, and perfect with icecream or cream, as a dessert (but also in thick slices for afternoon tea). Nigella suggests preheating the oven to 190C, baking the finished batter for 30 minutes, turning the oven down to 170C, and baking for another 15 minutes. I have a slow oven, so I preheated to 210C, baked for 40 minutes, turned down to 190C, and baked for 20 minutes. I think my temperatures were good, but I’d probably cut 5-10 minutes off the time. Grease and completely line a loaf tin. Cream the butter and sugar together. I stuffed up here in attempted to slightly soften my butter, and instead completely melted it. I think this made a bit of a difference to my batter, which may also effect the cooking time. Add the eggs and vanilla to the creamed butter and sugar, and beat well. Fold in the slightly cooled chocolate, taking care to blend well but not overbeat. Add the bicarb to the flour, and add, alternately spoon by spoon with the boiling water, until you have a smooth and fairly liquid batter. Don’t be alarmed if the batter is very liquid, and you think it’ll never cook. It will. And really, take time in adding the flour – lumps are annoying. Pour the batter into your lined loaf tin. Bake according to Nigella’s instructions (30 minutes at 190C, 15 minutes at 170C), or mine (35 minutes at 210C, 15-20 minutes at 190C). The cake will still be a bit squidgy inside, so there should be a little mixture on a testing skewer. Leave the cake for a couple of hours to cool completely inside the tin. It’s intended to sink in the middle, although mine didn’t, due to said overcooking. It’s still delicious with the overcooking, I just don’t think it’s quite what Nigella intended. Turn out, slice, and eat. That’s a really great recipe that I use a lot, as I often don’t have lots of chocolate hanging around the house, and this recipe only needs a little bit. I did note that when I make it the texture is much closer, with fewer air pockets in the cooked cake; I wonder if that is a result of the different ovens/cooking temperature. Not that it looks bad at all; just it’s interesting to see what things look like when other people follow the same recipe! The oven makes a difference – since moving and taking on a new oven, this has turned out in various different states, although I’ve baked it a dozen time, perfectly, in the past. Unfortunately, it can simply mean: experiment! If it goes mad in the oven (as it can!) turn the temperature down 10 – 20 degrees, and add 5 minutes or so. This is a great recipe! It lasts well in the frig if wrapped well and I can cut a slice whenever I need a chocolate fix. It’s really not hard to make.